Device is in close to new condition, but will certainly have one or two minor blemishes that are almost unnoticeable to the human eye. This device will be fully tested and fully functional. A full warranty will be supplied. 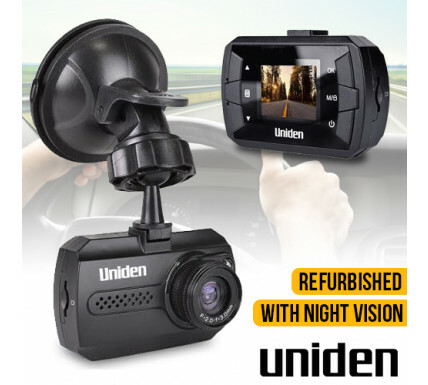 The Uniden CAM250 Full HD dashboard camera system is a must-have vehicle accessory to protect you from fraudulent claims, or capture the beautiful scenes along your ride. It features broad 140 degrees of field of view, and captures clear, sharp 1080p @30fps video. With IR night vision capability, you can still keep track of what happens on the road in complete darkness. An array of considerate features helps you get the most out of your car DVR with minimum effort, like auto on/off with your car, auto loop when the memory is full, and G-sensor function that locks and overwrite-protects video recorded in the event of strong movement or crash. You can view the video on the 1.5" LCD screen, or output it to your TV via HDMI to share with friends.